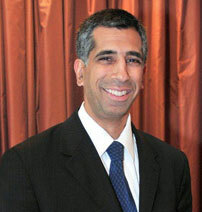 The Eastern Vascular Society welcomes our 33rd President for the 2018-2019 term, Anil P. Hingorani, MD. I would like to thank the membership for the privilege to serve the Eastern Vascular Society as its President this year. The EVS has been very active with not only its meeting, but a number of other initiatives in the past several months and we look forward to continuing this expansion of the organization's work on behalf of our members, our vascular specialty and our patients. Under the leadership of my immediate predecessors, Drs. Chaer, Harris, and Mehta, the EVS Council has been working on the development of a robust Allied Health program and an outreach program directed for patient education (V-Aware). During my Presidency, these projects will be continued in addition to starting a community outreach to high school students (V-Healthy) and a program focused on radiation safety. Our next EVS meeting promises to be exciting and educational with the highest level of scientific presentations. The meeting will be in Pittsburgh from September 5-7 at the Omni William Penn Hotel. We look forward to see you in Pittsburgh for the 2019 annual meeting!